The problem, I think, was lack of Graham crackers. I mean, we had some truly excellent biscuit options in the UK. I’m going to take a stand here and call it: I believe Britain to have the Best Biscuits in the whole wide world. But Graham crackers and the thing, and that makes a difference. But now, living in NYC, and with easy access to the right sort of cookies, and, most importantly of all, with a real wood-burning fire in our apartment *faints with joy, is lulled round by the gentle warmth of the FIRE, faints with joy etc etc. 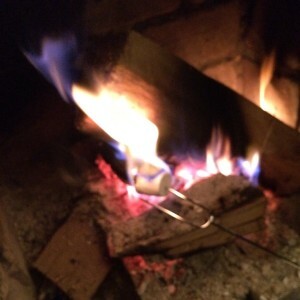 * smores are on the menu. The ideal end to a simple dinner party – or even a fancy one, frankly, because who doesn’t like an interactive dessert? So I bought the toasting forks for Jon for Christmas. But, the more we’ve made them, the more we realized, we could have been doing this over candles for years. 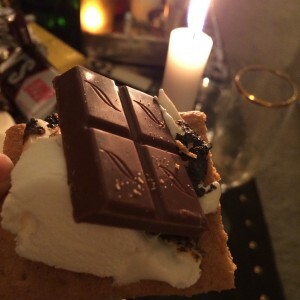 This entry was posted in Random Thoughts and tagged dinner party, fun, recipe, s'mores. Bookmark the permalink.